For those brought up more recently on an afternoon of Twenty20, the phenomenon of Timeless Tests back in the first half of the 20th Century may be greeted with a mixture of utter surprise. Traditionally the preserve of Australia, other countries did indeed take part in this oddity when a series was still alive going into the final Test of the rubber. Unlimited play was allowed until a victor emerged. Edging Towards Darkness details the ninety-ninth such match - and very much more - between South Africa and England and which still ended in stalemate after a record nine days. England's last provincial fixture of the tour had to be cancelled due to the continuation of the Test. This extraordinary match actually lasted twelve days including rest days and a day on which no play was possible due to rain and was only eventually abandoned as England might have had a significant wait for a ship home had they missed their booked one. They had a gruelling train journey from Durban to Cape Town before setting sail. John Lazenby's excellent book details the events of every day of this bizarre match which has gone into cricket folklore. He also sets the scene of previous and latter matches played between the two sides as well as a resume of the tour before it reached its epic conclusion. It is difficult to know which of the many statistics of the match is the most remarkable. Was it the 1981 runs made which still stands as the most in any Test? Or England's second innings total of 654 for 5 requiring just forty-two more runs for a victory when the rains came down for the final time? This total is still over 200 more than any side before or since has made in the fourth innings of a Test. Sixteen individual scores of fifty or more were made; seven South Africans scored 50 in at least one innings as did six Englishmen. Six bowlers bowled over 60 - eight ball - overs in the match. It is small wonder that both the players and spectators were exhausted by the end of this remarkable spectacle. On a more amusing note, South African player, Ken Viljoen, felt the need to have his hair cut twice during the match. Set against the impending onset of World War II, John Lazenby's expert research brings in the fears of the cricketers and, at some length in the latter stages of the book, chronicles the details of the part played by the players in the subsequent war. Sadly, three paid the highest price of all: Englishmen Hedley Verity and Ken Farnes and South African Chud Langton all lost their lives. South African fast bowler, Norman Gordon, about whom much is written, did though become Test cricket's first centenarian. The records of eminent scorer, Bill Ferguson, remain and I am much impressed by the detail of the match found by John Lazenby. By a strange quirk of fate, my mentor and scoring and statistical legend, Bill Frindall (who shared the same initials, WHF, as Ferguson) arrived in the world on the very first day of this epic match. I know from experience that he would have disliked the use of the word "wagon-wheel" but, if the author had access to Ferguson's radial scoring charts, then we, as readers, should be much indebted to John Lazenby for his research. I do have to say that Edging Towards Darkness is a terrific book and one of the best I have read recently. 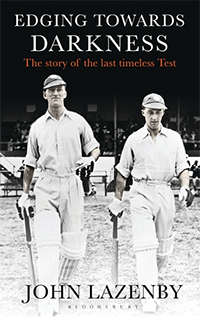 In this era of quick-fire cricket many matches of which may be quickly forgotten, Edging Towards Darkness keeps Test cricket's rich history and heritage going and John Lazenby must be congratulated on this excellent book.